Since some time, Aurena Laboratories AB has introduced the new Sparkling Saline Nasal Spray product portfolio to brand owners around the world. The products offer a unique, refreshing, and invigorating experience among consumers who use nasal sprays. 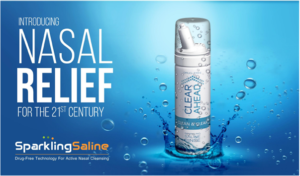 Sparkling Saline Nasal Spray is a patent-protected technology platform for carbonated saline-based products that can be leveraged across numerous market segments. 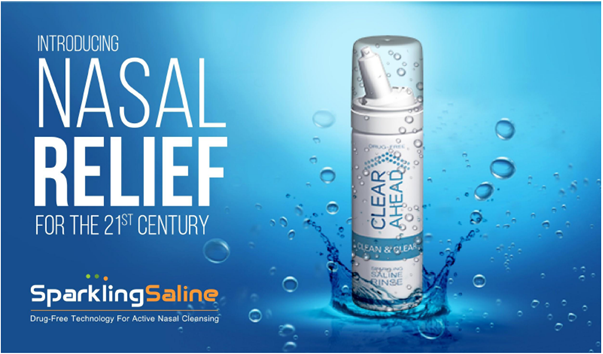 The Sparkling Saline Spray is a new generation of saline and seawater nasal sprays that are infused with microbubbles that reaches deep into the nasal passages to help reduce congestion and clear the nose. This is a unique drug-free nasal rinse with clinically proven ingredients of saline and carbon dioxide (CO2). The patented triple action formula combines saline with the energetic carbonation properties of CO2 to create a revolutionary rinse designed to cleanse, clear congestion and neutralize the effects of inhaled particulates, irritants, and germs. The available products range is CE-marked as class IIa medical devices and will be applied to consumer products for Allergy, Cold & Cough, Sinus Relief and Daily Nasal Care, where careful formulation with carbon dioxide (CO2) provides a demonstrably better patient experience as well as benefits such as faster and more complete nasal relief. Carbon Dioxide provides the unique sensory cue for Sparkling Saline. In addition, it enhances the wetting properties of the saline, has disruptive effects on bio-films and thick mucus, and creates a hostile environment for pathogens. In-vitro data supports Sparkling Saline effectiveness in reducing nasal bio-films, a cause of upper respiratory infection, chronic sinusitis, and associated with poor patient outcomes in post-operative recovery. Sparkling Saline has a lower pH than regular saline, making it more hostile to harmful bacteria and viruses. Sparkling Saline has superior wetting properties than regular saline due to surface tension changes caused by degassing of carbon dioxide from the saline liquid. Enhanced wetting properties can have a positive effect on mucus thinning as well as clearing of mucus and inhaled debris. In addition, consumers inherently understand that bubbles are intrinsically linked to superior cleansing. Aurena is responsible for worldwide manufacturing, from its modern FDA-inspected facility in Karlstad, Sweden, where it has opened the world’s first production line for sparkling saline sprays. Sparkling Saline can form the basis for a range of ready-developed, market-oriented, CE-Approved products and well-documented products, with short time to market. These products will be unique, patent protected and can be well supported with scientific evidence, regulatory expertise and certification. For US-market the products can initially be classified as cosmetics and for the Canadian market as natural health products. Aurena welcomes brand owners from around the world to discuss this new opportunity. Click on Sparkling Saline Nasal Spray for more information.